Alzheimer’s Disease is a disease of ‘forgetfulness’. The symptoms of this disease include lack of memory, not taking decisions, difficulty in speaking and then due to this, serious situation of social and family problems etc. Increasing blood pressure, diabetes, modern lifestyle and many injuries in the head increases the risk of the disease. Usually there is no permanent treatment for this disease, which is around the age of 60 years. However, regular diagnosis and treatment can be overcome in the early stages of the disease. The brain’s muscles also affect the intellectual ability and practical symptoms of the patients. As we become old, our ability to think and memorize becomes weak. But serious changes in seriousness and ability to work in our brain are not a common symptom of aging. This is a sign that the cells of our brain are dying. There are one hundred billion cells (neuron) in the brain. Each cell creates a network by communicating with many other cells. The work of this network is special. Some think, learn and remember. Other cells help us in seeing, listening, smelling, etc. Apart from this, other cells direct our muscles to move. To make their work, brain cells work like small scale industries. They take supplies, generate energy, build organs and take out unnecessary things. Cells collect information and then process them. In order to keep the body moving, large amounts of oxygen and fuel are needed. The part of the industry of cells in Alzheimer’s disease stops working, thereby affecting other things. As the damage increases, the strength to work in cells decreases and eventually they die. It is a growing and dangerous brain disease. Alzheimer’s cells lose brain, due to which memory, thinking power and other behaviors begin to change. Its impact on social life. Over time, this disease increases and becomes dangerous. This is the most common form of memory loss (dementia). Other intellectual activities also start to diminish, affecting everyday life. Losing memory – Recently forgetting the information learned is the most common early symptom of dementia. A person often forgets and can not remember it later. Difficulty in performing normal tasks – Persons suffering from dementia often feel difficulty in planning and implementing daily chores. Many people also feel the difficulty in taking steps to make food or telephone or play a game. Problems with Language – A patient of Alzheimer’s disease begins to forget ordinary words or unusual synonyms, and his speech or handwriting becomes obscure. For example, he forgets the toothbrush and asks for something for his mouth. Inconvenience in time and place – Alzheimer’s patient is also lost in its neighborhood. He forgets where he is, how he came there and how to go back home. Difficulty or wrong decision – making decision – Alzheimer’s patient can wear silk clothes, many clothes in summer or very few clothes in cold. Its ability to make decisions is low. He can give a lot of money to the ignorant people. 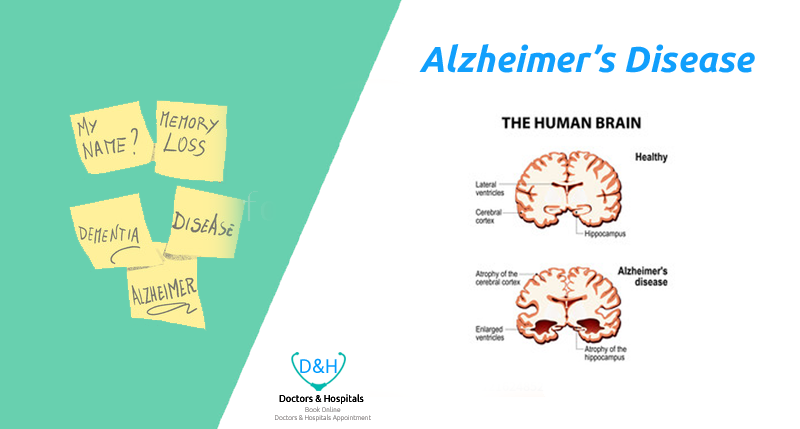 Problems with brief thinking – Alzheimer’s patient seems to be experiencing unusual difficulty in hard mental tasks, as he does not understand why there is a number and how it is used. Keep things in place – Alzheimer’s patient keeps things in place. For example, he could put iron (frost) in the fridge. Change in mood or behavior – Alzheimer’s patient displays rapid changes in its nature. Just as it causes unnecessary crying or anger or laughing. Personality changes – People suffering from dementia can change dramatically. He becomes very confused, suspicious, fearful or over-dependent on somebody. Inability to try – patients in Alzheimer’s may be very inactive, hours sitting in front of TV, too much sleeping or reluctant to complete normal activities. If you see any of these warning signs in yourself or in your immediate family, contact a doctor immediately. Identifying and treating, co-operation and support during the time of other disorders of Alzheimer’s or dementia are very important. There is no treatment for it now. But the symptoms of Alzheimer’s patients can be improved by treating symptoms and proper care, help, etc.